Over the last 3 episodes we have discussed the events in the Caucuses, in the Hejaz, and in Mesopotamia. Today we shift our focus to the fourth area of major operations in the Middle East in the last half of the war, the southwestern portion of the Ottoman Empire which incorporated the Sinai peninsula, Palestine, and Syria. It would be in this area that the British would make their primary effort to push the Ottomans out of the war in 1917 and 1918. They would seek to accomplish this goal by advancing out of Egypt, starting at the Suez Canal, move across the Sinai peninsula, and then north through Palestine and Syria. In this episode we will focus just on the first part of that plan, advancing out of Egypt and into Palestine where the British would fight two battles of Gaza, of which there would be a total of 3 before 1918. Next episode we will then continue our discussions of the British attacks during the last year of the war. Since we are back in this area of the Ottoman Empire for awhile, remember that Palestine includes modern day Israel, and some small pieces of the surrounding countries while Syria incorporates all of modern day Syria, Lebanon, and Jordan. We begin our chronicle today after the evacuation of the troops from the Gallipoli peninsula in early 1916. At the beginning of 1916, and with the evacuation from Gallipoli there would be some confusion around who was commanding what in Egypt. There would be 11 divisions that would return from Gallipoli and then be sent to Egypt and they needed to be housed, supplied, and refitted before they were either sent to other fronts or moved to the front in Egypt. In early January the Mediterranean Expeditionary Force, which had incorporated the troops at Gallipoli arrived in Egypt and they were commanded by General Murray. Murray would not initially replace the commander that was already in Egypt, General Maxwell, and instead they would split their responsibilities. Murray would be responsible for defending the Suez Canal and Egypt's eastern border while Maxwell was responsible for the Western side of the country. This organizational setup never really worked, both Murray and Maxwell believed that this division of responsibility hurt their ability to defend Egypt as a whole. These concerns would eventually result in Maxwell's position being removed in March 1916. This was a good move from an organizational perspective, but it did remove Maxwell from the theater, and he had been a respected commander not just by his troops but also with the Egyptians. With Murray now in command, the troops in Egypt were renamed to the Egyptian Expeditionary Force. While there were already plans for future operations being formulated there was still a large number of troops moved out of Egypt and onto other fronts during this time period with 10 divisions being sent to France and one to Mesopotamia between March and June 1916. Even with all of these troops moved out of Egypt the British still planned to attack into Palestine, but there were some serious problems that they would have to overcome to make this plan a reality. The campaigns out of Basra and into the Sinai would both occur in late 1916, which meant that the British had to find a way to support two advances into enemy territory, separated by hundreds of miles, into land that was not exactly easy to move an army through. Both campaigns would also involve far more troops than any pre-war British expeditionary force. The British had, for centuries, built up experience in moving relatively small forces into far flung areas of the globe, but during the First World War they would be called upon to support hundreds of thousands of men in multiple different areas of the Middle East. The forces would also grow during 1917 and 1918, and by the end of the war there were over 450,000 troops in the Egyptian Expeditionary Force and over 400,000 in Mesopotamia. This would push the logistical capabilities of the British almost to the breaking point. The situation was made worse by the famine that occurred in Palestine. The British would be marching into an area that could not even support its civilian population, so any kind of local supplies would be non-existant. Everything that was required for the army would have to come through Egypt, then either be transported by land or sea to the front. This would also strain local Egyptian resources, and this strain would have consequences after the war as the British would force too much harship onto the Egyptians which had counted on for support to maintain their ability to rule the country. While the British were preparing for their attack, the Ottomans were still in control of the Sinai peninsula and they were not planning on simply passively defending against a British attack and instead they hoped to launch some of their own. To try and support these troops they had taken the steps of extending the railway from Beersheba and bringing it south closer to their positions in the Sinai. The hope was this greater access to supplies would allow the Ottomans to get within artillery range of the Suez canal and stay there. This is really all that they had to do to shut the canal down, they did not have to capture it, instead they just had to make it unusable for the British. The issue for the Ottomans in this area was that, much like the British, they would be forced to give up large amounts of supplies and men to move to other fronts. This sapped these units of their ability to attack, but it was necessary to shore up other fronts where the enemy was already putting on pressure. Unfortunately, this left the Ottoman defenders at their weakest right before the British launched their attack, but it did not mean that they gave up their hopes of another offensive. I have mentioned several times that the British planned on advancing out of Egypt, but what exactly were they planning to do? A critical piece of advancing away from the Suez Canal would be maintaining a supply of water. This was well known to the British and they identified a series of oases that they could seek to occupy and control. Along the way they would construct a single-track railway behind the advance to carry supplies and they would also construct a water pipeline which would be absolutely essential when trying to keep large numbers of troops advancing across the desert. These construction efforts, plus the oases, would allow the British to leapfront across the desert. On the other side they hoped to capture the village of Qatiya and then the Mediterranean port of al-Arish. The key to the entire campaign was to get to el-Arish. It was the objective that Murray gave to London when trying to get support for the attack. Approval for the plans were given on February 27th 1916 by the Imperial General Staff in London however it would take most of the year to finalize plans and stockpile supplies to make the leap across the desert. As I mentioned earlier, the Ottomans were not happy to sit and wait for the British to attack, and it would be their next attack that would start the British advance. This attack would occur on August 4th, 1916. It would be on this date that an Ottoman force, bolstered by German machine gun and trench mortar companies, attacked the city of Romani. This attack caught the British off guard because it was launched at the height of summer, when temperatures routinely reached 50 degrees Celsius, that is 122 Farenheit for the Americans in the audience. No matter which temperature scale you use, it was real, real hot. So just when the British troops, which were primarily from Australia and New Zealand, thought they were safe they would find themselves attacked by 8,000 Ottoman and German soldiers. These 8,000 troops would later be reinforced by more, bringing the total number of attackers up to about 16,000 while the total defenders would eventually number 14,000. Over the course of the next 3 days the fighting would continue until eventually the Ottomans started to run short of ammunition and more importantly water. Once these supplies began to run low the attack was doomed to failure. By the time that the Ottomans began what would turn into a long retreat they had lost 9,000 men as casualties and another 4,000 would eventually become prisoners. With the Ottoman attacks stopped in their tracks, a pursuit began that would not end until the British were in Palestine. Over the course of the next 4 months the British, Australian, and New Zealand troops would pursue the Ottoman forces across the peninsula. By December they were at the gates of al-Arish at which point they paused only to allow the rail tracks to catch up to the advance so that more supplies could be brought forward. When the British prepared to launch their attacks the Ottoman defenders simply abandoned the village. 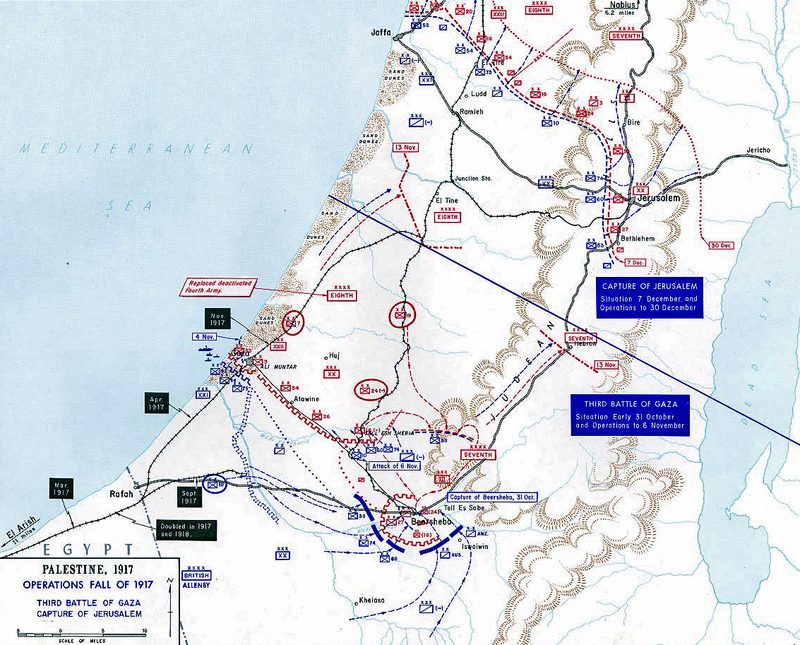 After al-Arish was in British hands they then would push on to Rafa on the border with Palestine. During January 1917 other small garrisons around the Sinai were mopped up by ANZAC cavalry forces, leaving the Sinai completely under the control of the British forces. Immediately Murray and the British leaders began to prepare for the next stage of their attack, an advance into Palestine. This required some effort because by this point there were 200,000 soldiers on the border with Palestine, and these required 1.2 million gallons of water every single day. Supplying this amount of water, not to mention all of the food and other supplies that were required was no small effort. It was only in March that the British felt like they were able to continue their attack, only to be stopped in the First Battle of Gaza by the Ottoman defenders. With the British entering Palestine they were now entering a core area of Ottoman control. Here the Ottomans had maintained strong control over ever facet of life during the war, and it was apparent when looking at the state of the area. Syria and Palestine had been hit by a sever famine in the first two years of the war, a situation made worse by the Ottoman politices of extracting supplies for their military. There was also a concerted effort to prevent supplies from beign imported from other parts of the empire to preven them from falling into the hands of those that did not support the Ottoman control of the area. These policies, along with the crackdown on Arab nationalists that we discussed in our conversations about the Arab revolt caused a rift to develop between the Ottoman military and the peopld who lived in Palestine. This rift would result in little support for the Ottomans among the populace, and it would also cause some anxiety among the British when they took control of the area later in the war. This anxiety is evident in multiple accounts frmo British leaders in 1916 and 1917. Sir Mark Sykes would say in June 1916 that "the people of Lebanon are now being systematically exterminated by starvation." While in December 1917, after the capture of Jerusalem, Sir Ronald Storrs would write that "the most urgent problem is of course food’ as ‘my chief, my nightmare anxiety, was the scarcity of food amounting almost to famine." As the British forces captured more of Palestine they realized that the famine and diseases that were running rampatn in the populace had to be solved. The British hoped to control this area after the war and they wanted to make sure that the people supported them, and there was no better way to do that than to make their lives better after an event like a famine. For the moment though, the British did not control Palestine, and in fact they had been rebuffed in their first attempt to take the area around Gaza. With this defeat the British, led by Murray, began to plan for their next attack, an attack that would eventually become the second battle of Gaza. We will not be going into great detail for this battle, however, I did want to focus on one specific piece of this battle, gas warfare. The use of gas is primarily identified with Western Europe, the concentration of men and artillery made it easy to put in place, but that does not mean it did not make appearances in other theaters and in the Middle East it would be at the second battle of Gaza that poison gas made its debut. Conversations about using gas in the theater began in early 1917 when Murray requested over 20,000 gas shells, half of them being tear gas and half deadly asphyxiating gas. Part of the desire for these weapons was out of concern that the Ottomans would use them first, a fear that had already caused every unit in both the Egyptian and Mesopotamian Expeditionary forces to go through chemical weapons training before the end of 1916. Along with gas shells tanks would also make their debut in the Middle East where they would be used to assist attacking infantry, mostly as mobile cover over the areas of the front where little natural cover was available. The plan for the second battle was for General Dobell's Eastern Force to mount a direct assault against the Ottoman defenses at Gaza. There were discussions about a possible flank attack near Beersheba, which would be used in the Third Battle, but in this case both Dobell and Murray believed that it was not possible for the second battle. The battle would occur in two phases, the first woudl begin on April 17th with this first phase being mostly successful. The British troops would advance several miles and then on the 18th they would pause while more troops were brought forward, positions were improved and artillery fire continued. The second phase of the attack would be preceded by a heavy artillery bombardment the night before, during which gas shells would be used against enemy infantry and artillery positions. Then the next day the artillery fire would begin firing again at 5:30AM and it would continue for 2 hours. While the British were concentrating as much artillery fire as possible on this area of the front it would still be just a fraction of what would be found in early 1917 on the Western Front. The British even used ships anchored at sea to help add to the amount of artillery being fired against teh Ottoman defenses, but it would never be enough to fully neutralize the Ottoman defenses. The gas shells, and especially the phosgene would not perform well during the bombardment, which would only be discsovered after the attacking infantry went forward. I am not a chemist, but one of the sources, and I think some information I found online if I am reading it correctly, point to the high temperatures of the battlefield as one of the big reasons for this disappointing performance. The temperature, even early in the day when the attack began, was much higher at Gaza then on the Western Front. These high temperatures reduced the phosgene's effectiveness because it caused the gas to evaporate much more quickly, greatly decreasing the amount of time it spent in its fatal concentration amount. Many first hand Ottoman and German accounts do not even mention being shelled by gas, which means many may have not even noticed it. The other facet of the bombardment, with high explosive and shrapnel, would also not be sufficient and when the British infantry attacked on the 19th they found that the Ottoman positions were still mostly intact and the defenders were ready and able to defend them. Because of this the gains on the 19th were very slight and near the end of the day these slight gains, many of which were just a few Ottoman trenches, were hit by fierce Ottoman counterattacks, which pushed the British back to their start lines. The initial goal had been to continue the attack the next day, but the complete failure of the attacks on the 19th caused future attacks to be cancelled. The battle would cost the British 6,000 casualties and 3 tanks, sacrifices that accomplished very little. The Ottomans had also suffered a few thousand casualties, but they had stopped the British which was a huge boost for Ottoman morale. Back in London, with the Egyptian Expeditionary Force running into so many difficulties it was decided that it was time for a change. Next episode we will discuss the arrival of General Allenby, who would be in command of the EEF for the rest of the war as they marched on to Jersalem and beyond.